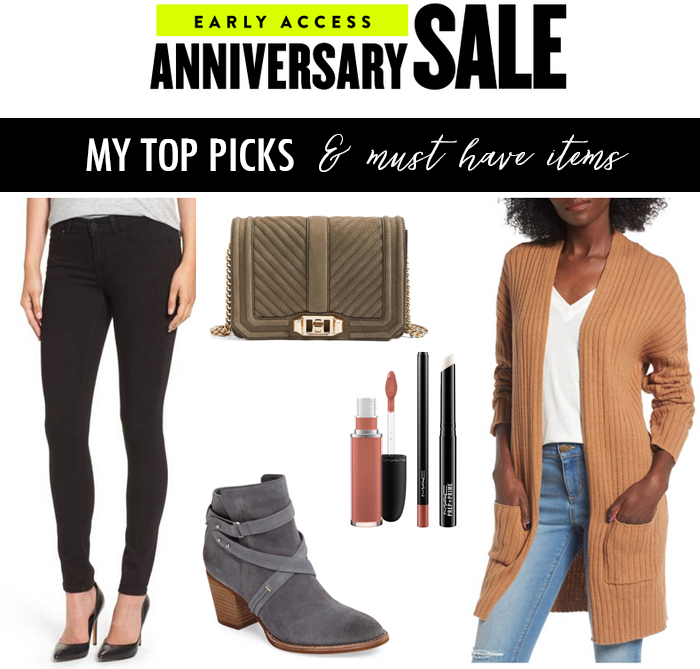 Today is the big day - the 2017 Nordstrom Anniversary Sale has started for all those with early access. I typically am overwhelmed looking at everything for the first time. There is just so much - and I feel a bit rushed because I want to make sure I get the best deals before they sell out. As far as strategy, I begin with my favorite categories first - starting with jackets, then, sweaters, tops, boots, designer jeans, and lastly beauty. At first glance - here are my favorite top picks - and my must have items. I have had troubled narrowing it just a few. 1. I love this relaxed blazer that comes in four great colors. 2. I saw this cozy mixed wool coat in the look book that comes in two perfect fall colors - and such a great price. 3. There are so many leather jackets to pick one - this one is only $65. 1. This was my favorite cardigan of the sale last year - and this popular carigan is back this year - only $32. 2. This bell sleeve sweater is only $32 - and comes in the most perfect fall color. 3. Tie-front tees are a big trend - and this sweater is just as cute. 1. I stock up on my favorite basic tee each year during the sale. 2. This closet staple basic v-neck tee is great deal! And, there are more colors and stripes here. 3. This ruffle and peplum hem top would be perfect for date night or work. 1. This tall suede boot is one of my top picks. There are three great fall colors. 2. Leopard is my favorite - and these leopard ankle booties are a top pick. 3. These slide loafers are such a great deal - and love the color choices. 1. My favorite designer brand has this pair for a $100 off! 2. I love grey jeans, especially in the fall - and these are a great deal. 3. The cropped jeans are big trend - and these with the split hem are fun. 1. This quilted bag comes in the best color fall - and great price. 2. This satchel looks just like the designer one and is only $52. 3. This is a fun striped tote (that also looks like a designer one) and is only $36. 1. This was one of my favorite perfumes growing up - and it seems to be back - and this combo set is a great way to try it - with a set of three products for only $25! 2. One of my favorite lip stick brands - this two lipstick and two gloss set for only $27 is such a great deal! 3. My ultimate favorite shampoo/conditioner and hairspray - nothing beats how it makes my hair feel, look, and smell - great travel kit and price. Thanks so much for sharing all of these. The relaxed blazer is too cute. I really like the boots in your photo too. Thanks for linking up to Top of the World Style. Great picks! Great picks! I caved and got the new Barefoot Dreams Cardigan. I need to go back now and browse some more!